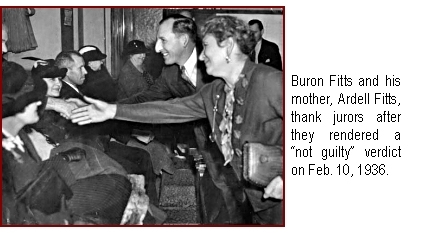 BURON FITTS on Dec. 3, 1928, was sworn in as the 29th district attorney for Los Angeles County, having resigned three days earlier from his post as California lieutenant governor. He had been elected as DA in the Aug. 28 primary election, facing one obscure challenger (and garnering 90 percent of the ballots). This does seem odd, doesn’t it? The Number Two constitutional officer of the state—a “heartbeat away” from the governorship—relinquished his post, with two years left in the term, to assume an office in county government. It’s not that Fitts didn’t want to be governor. He did—as evidenced by his try for that office two years later, as a candidate for the Republican nomination. Fitts didn’t succeed in winning the governorship…nor had the previous Los Angeles district attorneys who had recently sought the state’s highest executive office, John Fredericks and Thomas Lee Woolwine. In fact, no governor to that point had been elected while serving as a DA of any county (and none has since). By contrast, five lieutenant governors, to that point, had assumed the governorship, without being elected to it, based on the resignation or death of the incumbent; two persons had been elected as the state’s chief executive while holding the office of lieutenant governor—William Irwin (in 1875) and incumbent C.C. Young (in 1926). Fitts’ announcement of his decision to seek the DA’s post provided no real insight into his reasons; it contained platitudes. Fitts said in that letter, made public on May 18, that he made his decision to run with “extreme reluctance” because, if elected, he would have to give up his present post, as well as his mounting law practice. “However, I realize, in common with other citizens of this State, that the office of District Attorney of Los Angeles county is important to the welfare of the State as a whole,” he declared. So his being elected Los Angeles district attorney would benefit denizens of Merced and Lassen counties? “My decision to become a candidate has been reached, not only because of the suggestions that have come from well-wishers of the community and county, but as a the result of what seems to be a deliberate and planned campaign to dissuade me by threats, forms of attempted intimidation, and in a few instances, actual attempts to blacken my reputation. By that time, incumbent Asa Keyes had already announced he wasn’t running. The only viable competitor was Los Angeles City Attorney Ernest J. Lickley, an official of the Church Federation of Los Angeles (later to serve as a Municipal Court judge). Fitts did not identify who the “unscrupulous persons” were who sought to deter him from entering the race. In the end, the only other candidate on the ballot was a lawyer named Paul Barkdale D’Orr, who put on no meaningful campaign and lacked organized support. The tally was 11,732 votes for Fitts and 1,290 for his rival. His first challenge was to secure a conviction of Keyes, his former boss. Fitts, who had become a deputy district attorney in 1920, was promoted to a key spot by Keyes upon his appointment as district attorney in 1923 (to fill the unexpired term of Woolwine, who had resigned). Fitts was given the newly created post of “chief trial deputy.” The following year, Keyes made him chief deputy, a position he held until his election as lieutenant governor in 1926. It was this former benefactor of his whom Fitts was called upon to prosecute. The call came a month before he was sworn in as DA. Keyes had been indicted in connection with accepting bribes, and a special prosecutor was needed. The district attorney-elect was the logical person for the job. State Attorney General U.S. Webb appointed him on Nov. 7, the day before Keyes and his co-defendants were arraigned. While still serving as lieutenant governor, Fitts acted for the prosecution at that arraignment. Keyes was convicted and imprisoned at San Quentin. “I did not want to be District Attorney of this county. I much preferred to remain Lieutenant-Governor. That work is not subject to such slander and criticism as are heaped upon the head of a District Attorney. I tried in every honorable way to avoid the nomination. I knew what it meant to me personally, for I am a human being and the troubles and sorrows daily laid before me have their effect upon me. Are tears trickling from your eyes after reading that? Fitts’ hypersensitive, self-pitying nature did not go without notice. “Friends of Buron Fitts, district attorney of Los Angeles County, are advising him to…get out of the gubernatorial race. “With the campaign only in its infancy Fitts is declared to be in such a ‘high strung and tempestuous’ mental and physical state as to render him unfit to withstand the rigors of a vigorous contest for governor. “Fitts is one of the most thin-skinned persons ever to hold public office in California. and his condition is attributable principally to his inability to laugh off adverse criticism—and he has been getting plenty of it. “It’s a little difficult to estimate the value of Buron Fitts in relation to his candidacy for governor from the speech he made Monday night. “So high strung and tempestuous was he that his listeners feared he was about to collapse. Pale, thin, nervous and obviously overworked, he plunged into his subject of gangster crime with excitement that was alarming…. “If the writer still has any influence with this boy, who has gone so far in the past few years, he hopes that he will listen to this perfectly sincere advice. Fitts did manage to endure the rigors of the campaign, but came in a weak third in the primary, despite vigorous support from the L.A. Times. Mayor James Rolph of San Francisco bagged the nomination, with 377,398 votes, prevailing over the incumbent, Young, whose tally was 356,785 votes. Fitts drew 282,743 ballots, and the sole candidate on the Democratic ballot, Milton Young, attracted 93,499 votes of Republicans (under cross-filing). There was a fifth candidate on the GOP ballot…a person whose name you are bound to know (a courthouse in the Civic Center bears that name) but whose candidacy is not oft-recalled. Drawing a mere 3,570 votes was the person who, in retrospect, was probably the most illustrious of the contenders, Clara Shortridge Foltz. The August 28, 1930 issue of the Hayward Review proclaimed Rolph to be “virtually governor-elect of California.” That proved accurate. There had, so far, been no Democratic governor in the state in the 20th Century, and wouldn’t be until 1939. Later in 1930…on Oct. 1…the California Supreme Court handed down an opinion dealing with a contempt adjudication of a radio minister, Robert Shuler (discussed in this column on July 26, 2005). Shuler’s affront was to comment on a pending criminal proceeding related to the bribery of Keyes. From an historical standpoint, it’s an intriguing case, an indicator of the flimsiness of First Amendment prerogatives, as viewed by the courts of that era. Relevant to this discussion, however, is only a sliver of the case, the recitation that Shuler had aired commentary on radio that “Buron Fitts plead at times almost tearfully and at other times quite indignantly” against the position of the Los Angeles Superior Court judge. Previous DAs had not been characterized, so far as anything I’ve come across, as being near-tears in court. Fitts maintained his popularity locally, winning re-election at the polls in the primary...a considerable feat given that he had seven opponents. According to a campaign expenditure report, $16,210 was spent on the reelection effort. In essence, Fitts had been accused of lying to the grand jury about his receipt of a sum of money from Mills for his orange grove that was far higher than the land was worth, Mills’ generosity occurring right before the charges against him were dismissed. There was, at the very least, an appearance of gross impropriety. But this was the Prohibition era; graft was the rule, rather than the exception; and much of the public was willing to forget the incident. In the 1936 race, Fitts drew four opponents. 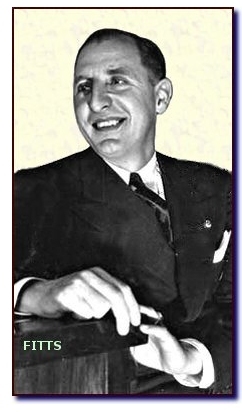 Chief among them was Hollywood Citizen-News Publisher Harlan G. Palmer, a former justice of the peace. Palmer made it into a run-off. The tally in the Nov. 3 general election was close: 521,345 votes for the incumbent, 487,444 for the challenger. But four years later, when Fitts made a try for a fourth term, a challenger, U.S. Rep. John Dockweiler, toppled him by a vote of 779,221 to 516,929. Fitts returned to law practice, then joined the Army Air Corps shortly after the outbreak of World War II, serving as a major. He still had a limp from his World War I gunshot wound, and had incurred additional wounds on March 8, 1937 when a sniper fired at him through the windshield of his car. His body was found March 29, 1973, on the driveway of his home. Fitts had apparently committed suicide by shooting a bullet into his brain. He was 78.